Did you watch the Grammys last night? I tend to try to stay away from award shows as they produce a lot of anti-Trump dialect but I did watch the 61st Annual GRAMMY Awards at Staples Center last night. Since President Donald Trump’s election in 2016, the language at award shows makes me uneasy and I tend to hold the remote control ready to change the channel. 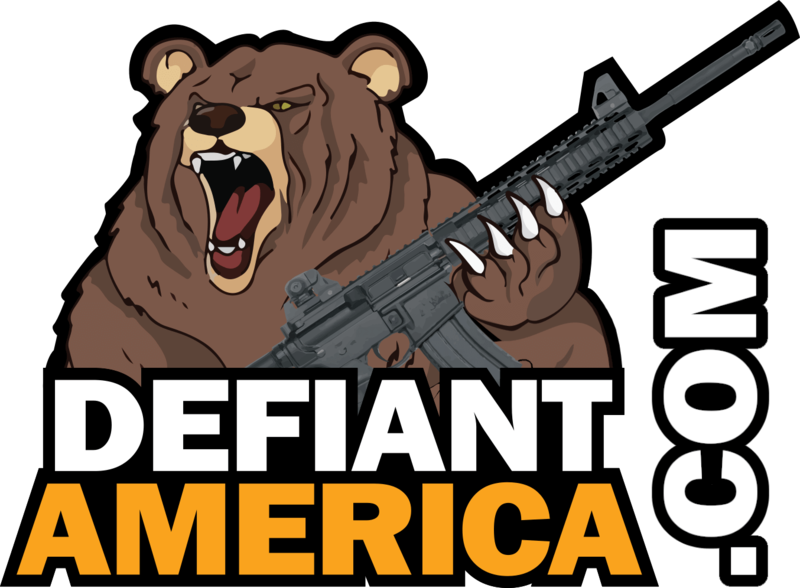 I was pleasantly surprised when I didn’t hear offensive rhetoric from famous people. My finger was itching to click when Michelle Obama stepped on the stage but she didn’t say anything offensive. I stuck with the show and held onto my remote control. I was ready for anything. 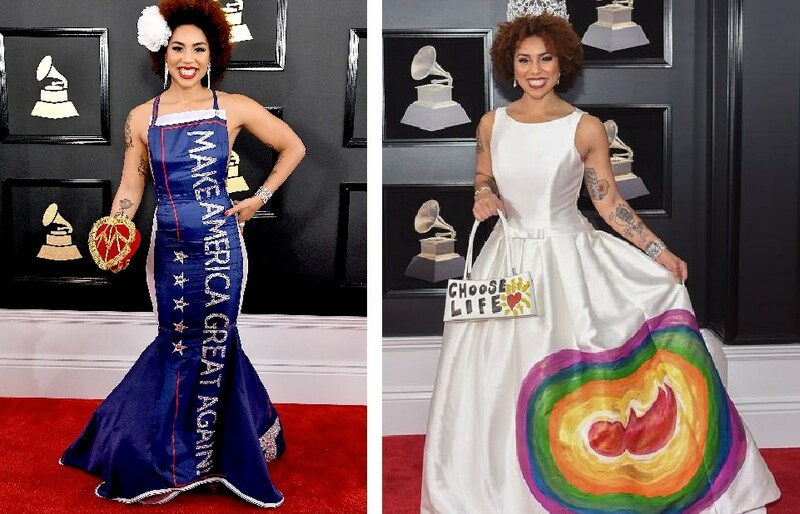 Joy Villa, 27, has shown her support of Trump for a couple of years now. 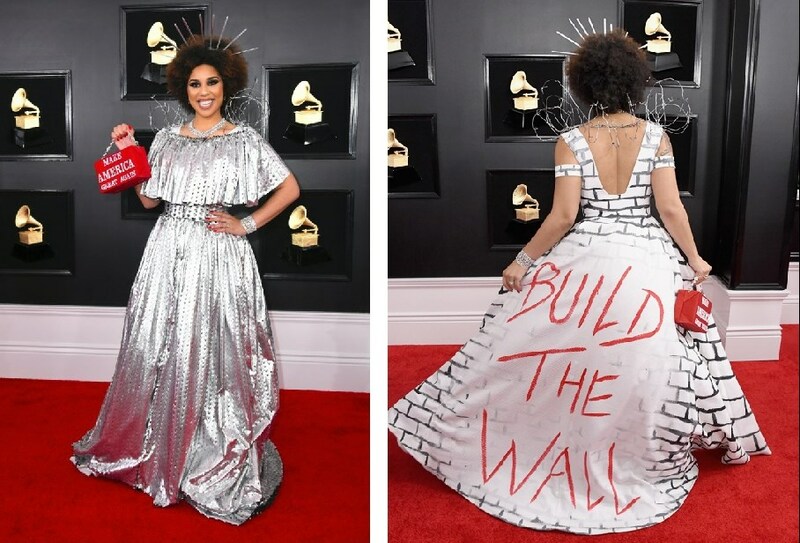 She has dressed in outfits that surely show off her sentiments. 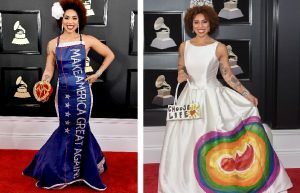 Last year, the singer donned a rainbow-colored anti-abortion dress and in 2017 she wore a blue ‘Make America Great Again’ gown that featured Trump’s name and slogan. Once inside, she removed the silver and showed off a low-cut gown emblazoned with bricks and a back that read, “BUILD THE WALL.” Villa’s dress was designed by Desi Designs Couture. Then there was Ricky Rebel. Rebel, 38, sported a blue jacket that read “KEEP AMERICA GREAT AGAIN” down the front lapels with a white shirt and pants. He accessorized with patriotic star glasses and white heeled boots. 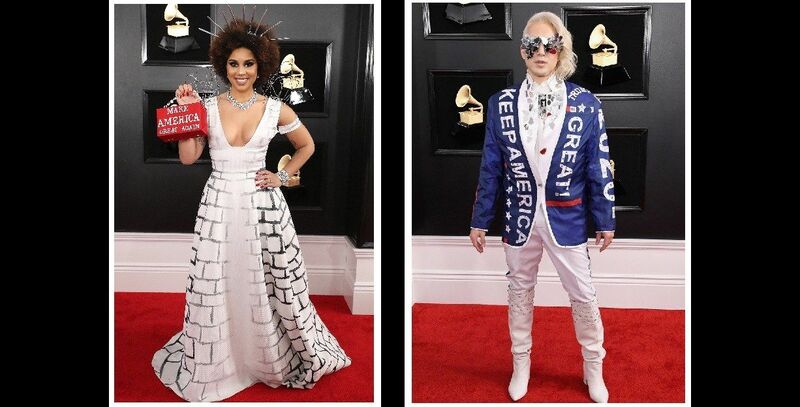 Ricky Rebel walked the red carpet in a blue jacket emblazoned with the words “Keep America Great” and “Trump 2020” over a white blouse, pants, and high-heeled knee-high boots. The rock artist has long been an active supporter of President Trump and faced the backlash over it. Rebel has love of all-things. Rebel, who is bisexual, has been an advocate for LGBT rights. 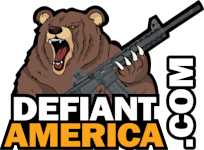 That doesn’t stop him from being a proud American who knows who is making America great. Previous articleWas the WRAP UP SMEAR Used on Trump?